Ideal for Adult and Children. Acidophilus Plus probiotic supplement is designed to help balance the intestinal flora of both adults and children Each capsule contains 9 different probiotic strains, plus a small amount of the prebiotic FOS, FOS are specific carbohydrates, which are indigestible by humans but which selectively promote the growth of beneficial gut bacteria at the expense of the unwanted pathogen bacteria. This 9-strain probiotic supplement is ideal for children aged 4 years upwards and adults up to their early 40's as the strains present are those which are most needed during these years. 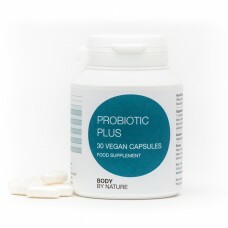 The prebiotics in this supplement are not in appreciable levels to have a prebiotic effect in the human body. The prebiotic is present to supply a food source for the live friendly native bacteria when they are rehydrated. It does not act as a food source for pathogens. This healthy bacterial balance in our intestine can easily be disturbed, most commonly due to illness, age, poor diet and antibiotic treatment. In such cases the bad bacteria will start to ‘colonise’ more rapidly than the good bacteria can replenish causing dysbiosis and pain, bloating, discomfort and even diarrhoea. It can be difficult to restore the good balance at such times. A wealth of relevant peer reviewed research information is available online from scientific and medical institutions worldwide that offers interpretations on the efficacy of live native bacterial strain supplements. There is also a body of research available from our own suppliers on the efficacy and specific activities of the strains in our products. This product description has been changed in accordance with recent legislation in respect of live native bacterial products formerly termed ‘probiotics’. For many years experience in nutrition science. We work closely with Doctors and scientists to produce supplements which are highly bio-effective, truly innovative and backed by research and studies.